Wilhelmina was photographed for our cover by Kenneth Helbron during a recent Chicago visit. Shocking pink coat by Marusia highlights the season’s favourite makeup and nail enamel shades. Coat from Martha Weathered. 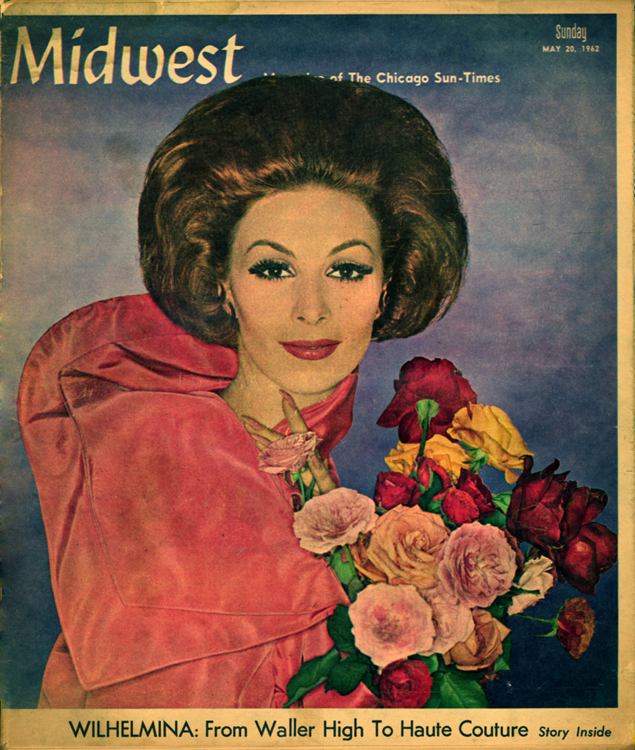 The colour supplement of the 30 May 1962 issue of The Chicago Sun-Times carried an article by Jean Neal about Wilhelmina, who also featured on the front cover. To see some photos of her, take a look at Kenneth Heilbron – mid-century fashion from Chicago. IT’S A LONG trip from Waller High School to the cover of Vogue magazine, but a girl named Wilhelmina Behmenburg made it in four miraculous years. Today her face is as familiar to readers of L’Officiel, THE magazine of the French couture, as it is to McCall’s and the Ladies Home Journal. Hers is an exciting success story, but it didn’t happen over-night. Even while she attended Waller, Wilhelmina was being interviewed, and turned down, for modeling assignments. After high school there was a job as designer-secretary in a fabric factory, some parttime convention work and constant discouragement. Neither Chicago stores nor agencies were interested in the 5-foot-10-inch German girl. She was “too big” for high fashion. It took a job at the International Trade Fair to turn the tide. Reigning as Miss West Berlin (because her factory boss submitted her picture), Wilhelmina met Shirley Hamilton, who was then director of a local modeling agency. Miss Hamilton was the first person to recognize Wilhelmina’s potential. By this time she had to convince Wilhelmina she could become a great model if she worked at it. It meant losing weight, learning makeup and hair styling, studying, exercising and more pavement-pounding. A few months later the “new” Wilhelmina met Chicago photographer Kenneth Heilbron. He booked her immediately for high fashion assignments. Under Heilbron’s direction she perfected her technique in front of the camera. In a few more months Chicago agencies were anxious for Wilhelmina’s services. In the fall of 1960 she decided to return to Europe on a vacation. (Wilhelmina was born in Holland, moved to Germany as a youngster and emigrated to the United States with her parents when she was 15.) En route she stopped in New York, where she was interviewed by Eileen Ford, head of the famous modeling agency. Then she continued on to Paris. When she arrived she was astounded to learn that she had two solid months of bookings through the Dorian Leigh agency. Chicago clients, with European branches, had alerted Miss Leigh to her arrival. She had booked Wilhelmina without ever seeing her! Then the whirl began. Her picture appeared in high fashion publications across the continent. There were jobs in London, Paris, Munich, Berlin, on the Riviera, in Switzerland . . . in two months the name “Wilhelmina” became synonymous with high fashion. Exactly one year ago she accepted the most exciting assignment of all. L’Official, official publication of the French haute couture, took her to the Sahara, where it photographed an entire collection of couture designs on her. When she returned to the United States last fall Eileen Ford immediately signed her to a contract. Her success in New York simply repeated her performance in Europe—two covers of Vogue magazine, every day crammed with bookings, every month dozens of photos in important national magazines. Last month Wilhelmina made one of her frequent visits to her parents’ home on Lakewood Av. Her father William is a butcher and her mother, Klasina, has her old job in the fabric factory. Wilhelmina’s success has enabled her to pay the mortgage on her parents’ house, buy them a car and, next year, send them to Europe. Because of her old friendship with Kenneth Heilbron, Wilhelmina agreed to work for him and The Sun-Times during her recent visit. The photos on these pages, and on the Fashion Flair pages of The Sun-Times next week, illustrate her extraordinary talent and Heilbron’s ability to capture it.